Moo-moo moo-moo moo moo. Moo-moo moo-moo moo moo. Moo-moo moo-moo moo, Mike. Moo-moo moo.....moo....moo mooooooooo! Mike Wohnoutka is the illustrator of over 20 books for children including Can't Sleep Without Sheep by Susanna Leonard Hill and Mama's Little Duckling by Marjorie Blain Parker. As a child, Mike practiced drawing on scrap paper his father brought home from work. His kindergarten teacher predicted the future when she said, "He is an artist -- I hope he continues to express himself through art." He continued to express himself through art and others noticed his talents including his high school art teacher and judges in an art contest that awarded him a scholarship to the Savannah College of Design. He planned on a career in graphic design until he saw a presentation given by David Shannon which led him to change his major to illustration. He graduated from SCAD in 1993. (Keynote Mazza Museum Summer Conference 2014). 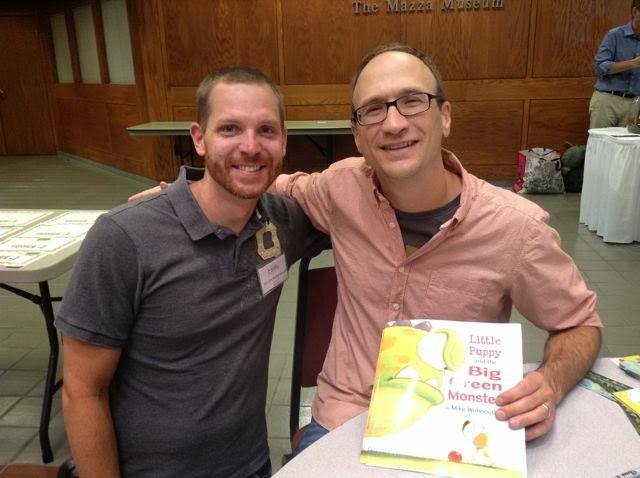 It took six years for Mike Wohnoutka to break into the children's book industry. He received many rejections, spent time working at a sculpting studio, and illustrated for many children's magazines. In 2000, Mike's persistence helped him publish his first book Counting Sheep, a Step Into Reading book. His first picture book came the next year when he published Cowboy Sam and Those Cofounded Secrets by Kitty Griffin and Kathy Combs. After some initial success and the birth of his son he began experimenting with a new style to attract more work. He went to New York to present his recently revamped portfolio. He received an offer to illustrate Jack's House at one of the meetings! Artwork from this book was included in the Society of Illustrators art show along with artwork from David Shannon. 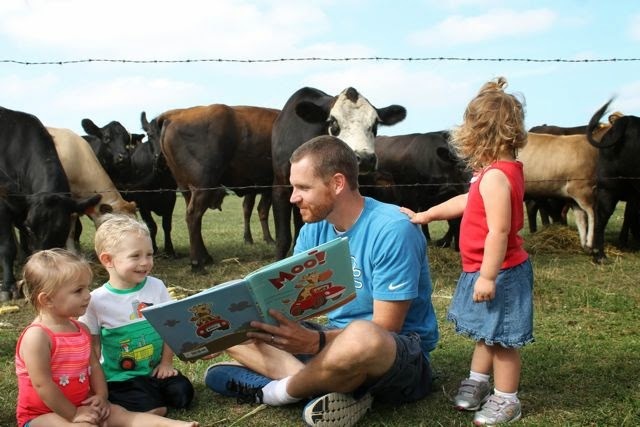 Recently, his picture book Moo! by David LaRochelle received the Minnesota Book Award. Also, he had his dream come true with the publication of his first book as an author-illustrator, Little Puppy and the Big Green Monster. (Keynote Mazza Museum Summer Conference 2014). From the moment I picked up Moo! by Mike Wohnoutka and David LaRochelle I knew it was the perfect book for my family. The illustrations are bright and full of emotion. 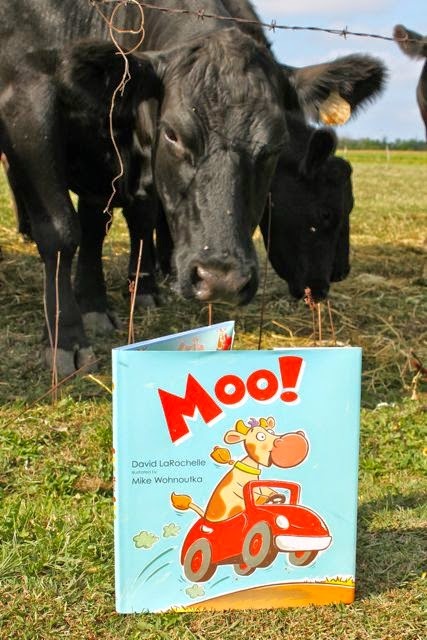 The text doesn't get any simpler for young readers as it is made up entirely, except for one word at the end, of moos! This book is udderly creative! Moo! is perfect for little ones and I have quite a few little ones in my family. A few of them just happen to live on a farm. My cousin and I spent many days together during our childhood on his family's farm. I have many fond memories of accompanying him as he did his chores, riding on the tractor, and playing basketball in the barn for countless hours. I remember watching a baby calf being born. 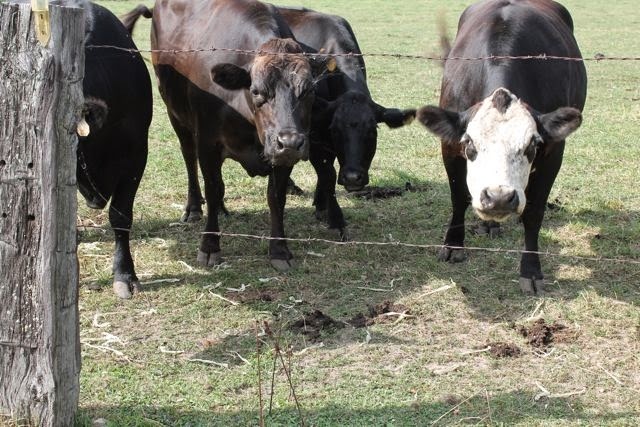 Once, I even helped convince an escaped cow to return to the fenced-in pasture (not very easy to do!). We stepped in many cow patties together just for fun, with boots on, of course! 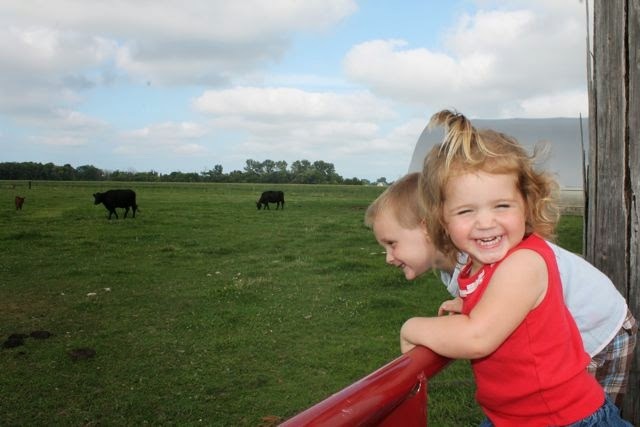 Fast forward 25 years, and now my cousin runs the family farm because "raising cows is in his blood." 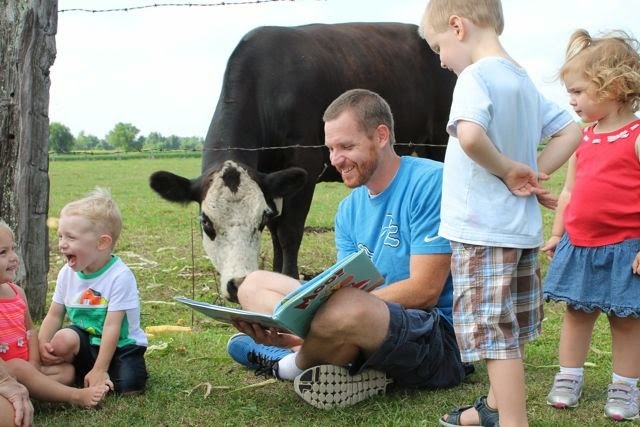 I was so happy that he allowed me to read one of my new favorite picture books at his farm! 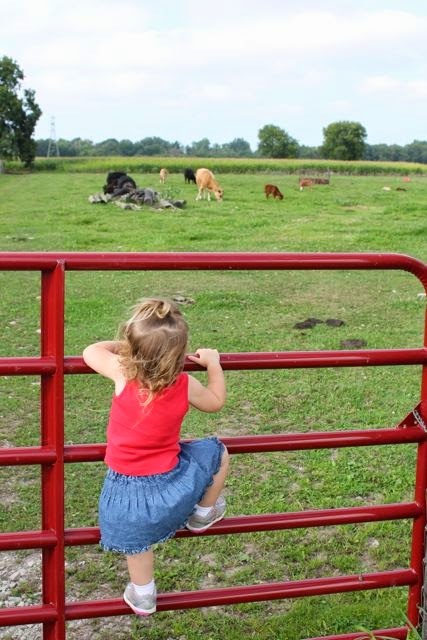 I was excited to visit my cousin's farm with my wife and two youngest children, but I got a huge surprise when we arrived. My grandparents, aunts, uncles, cousins, and new little cousins were all there. They had spent the day harvesting sweet corn together. They bagged over 125 gallon-baggies full of sweet corn to stock their freezers! After their hard work they were ready to relax with a good book! Hey ladies, do you want to read a story? They look like they might be a tough audience. 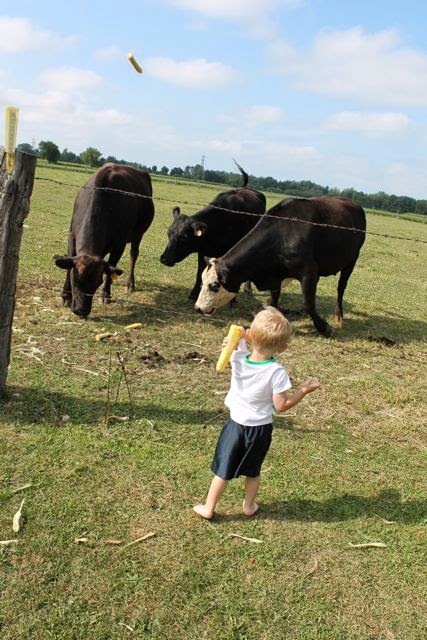 My cousin's son threw fresh corn cobs to the cows to encourage them to stick around for story time. I started reading Moo! and immediately everyone was interested in the book including the cow. Moo! really made us laugh -- A LOT! However, I noticed the cow behind me wasn't laughing. Maybe she was worried about the the cow in the book who took the farmer's car out for a joy ride and crashed it into a policeman's car. I was pretty sure the cow behind me would lighten up by the end of the book. It has a great ending! My daughter noticed that a few more cows showed up while I was reading! 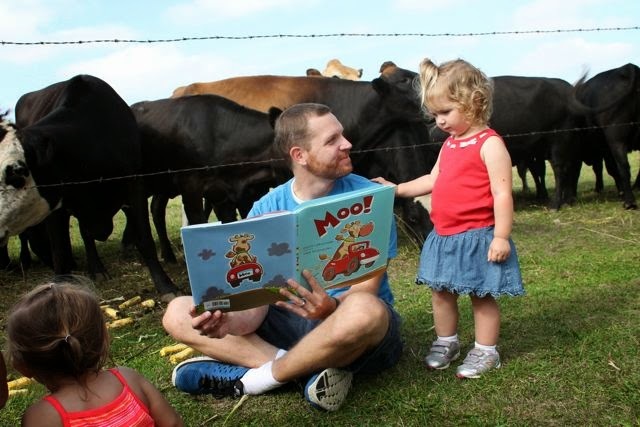 I asked my daughter, "Do you think the cows like the book?" "I didn't know cows knew how to read!" 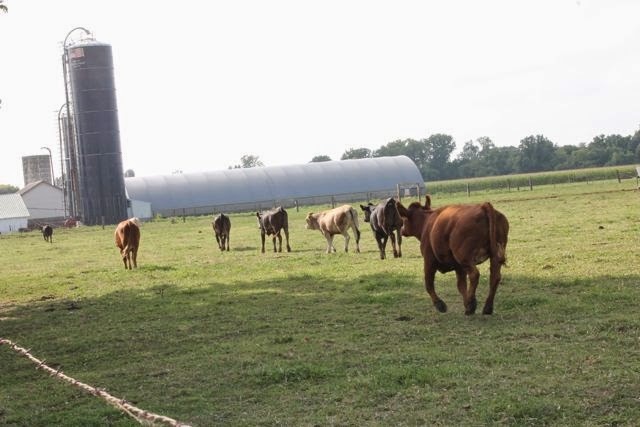 Story time was over and all the cows headed back across the pasture. Thanks for coming, gals! 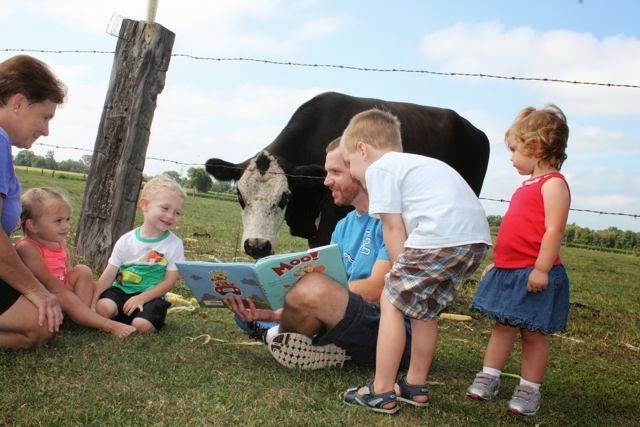 I know all the cows enjoyed the book -- even the worried cow. We realized later that she wasn't actually worried about the cow in the book. She just had a slight tummy (or is it tummies?) ache from eating about 68 of those corn cobs thrown in pasture by my little cousin! My cousin took us on a tour of the farm. 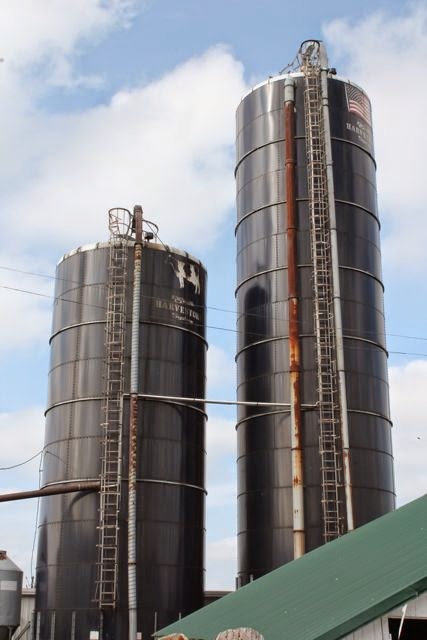 I remember climbing the silo on the left when I was little. We were told we could see Cedar Point from up there. I was disappointed when we couldn't. 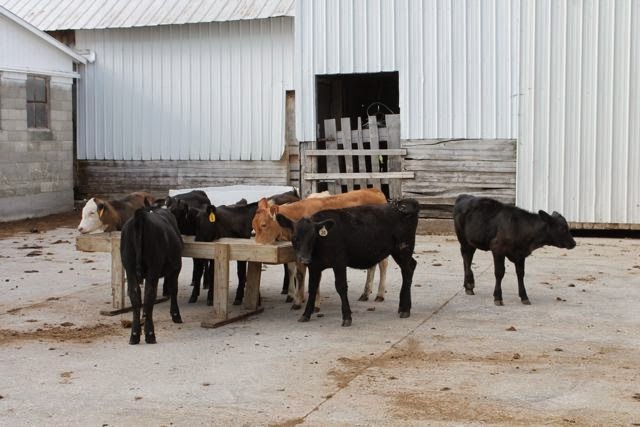 We saw all the new calves on the farm. 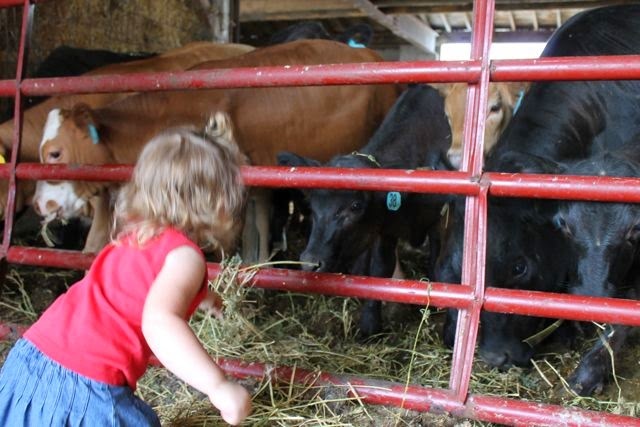 My daughter got to feed the cows some hay. 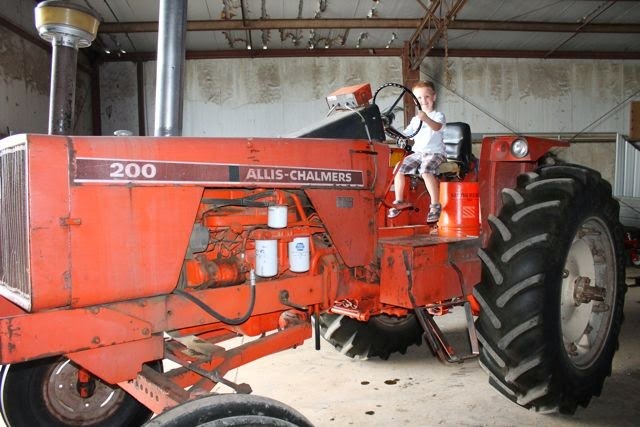 My son got to sit on a big tractor! The calf in the distance was only a week old! Cousin Mark: Thank you! Thank you, for a fun day at your farm! We had a great time! I was so happy to meet Mike Wohnoutka at the Mazza Museum in July. When I asked him to share his birthday he said, "September 4th. The same day as Syd Hoff!" How can you not love a guy who knows his author and illustrator birthdays! Thank you for sharing your birthday with us. We hope you have a Moooo-velous birthday! Check out Mike's latest book as an illustrator, MY BIBI ALWAYS REMEMBERS by Toni Buzzeo. It was just released, September 2, 2014. Read and follow the blog tour for this new book! Plus, Moo! will be a board book in November! Pre-order it today!